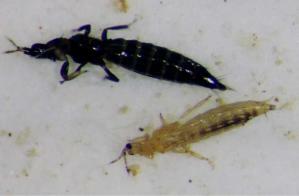 Adult and immature thrips (Thrips tabaci) (related species). Immatures (on top) are wingless and generally are light colored. Adults vary in color and have four wings lined with long hairs, it is about 1-1.5mm small. 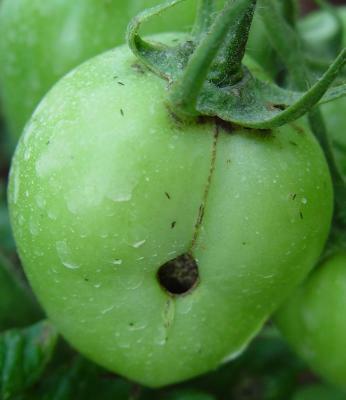 Thrips and their feeding damage on tomato fruits. Note residues of pesticide applied seen as white marks. Thrips on onion. Thrips are 1-1.5mm small. Thrips feed on the lower surface of leaves, buds, flowers and fruits. Both larvae and adults feed by piercing the plant tissue and sucking up the released plant juices. 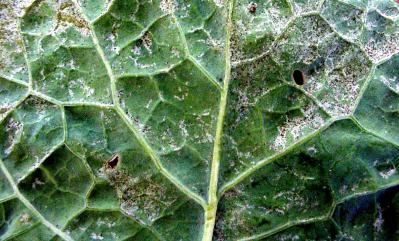 A heavy infestation causes premature wilting, delay in leaf development and distortion of leaves and young shoots. Under heavy infestations, when buds and flowers are attacked, abortion usually occurs. Thrips attack may also result in premature fruit shed. 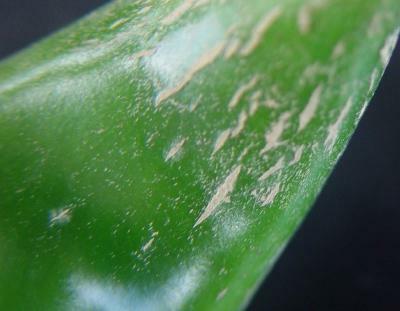 Thrips may also cause cosmetic damage to plants. 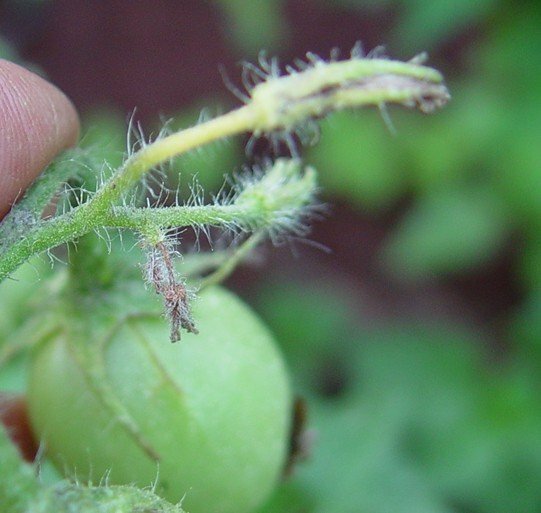 Thrips feeding causes scarring of flowers and skin blemishes and distortion of fruits (scarring, russeting, fruit cracking or splitting), which affects fruit quality. In addition, egg-laying spots may be surrounded by slightly raised, light coloured areas, which may lead to rejection of banana, tomato or peas grown for the export market. 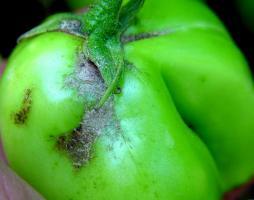 Thrips also cause indirect damage as vectors of disease-causing virus, fungi and bacteria. Several species of thrips are vectors of the tomato spotted wilt virus group in a wide range of crops (bell pepper, lettuce, pea, tobacco, potato, tomato, groundnut and a large number of ornamental plants). In addition, injuries caused by thrips feeding may serve as entry point for bacterial or fungal pathogens. For example infection by Fusarium ear rot on maize is facilitated by the western flower thrips, and purple blotch in onions by the onion thrips. The stage of growth when an infestation occurs seems to determine the extent of yield loss. Direct feeding damage is most harmful in dry climate and conditions, when heavily attacked plants lose moisture rapidly. Young plants are particularly susceptible, and there may be total losses at the seedling stage in onions, cabbages and cotton. Thrips attack a wide number of vegetables, fruit and flower crops and cereals. Some species are specific to particular host plants while other feed on many host plants. Both onion thrips and western flower thrips attack a wide range of plants including cereals and broadleaved crops. 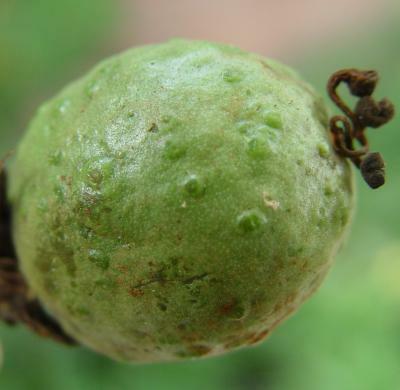 The characteristic symptom of attack is a silvery sheen of the attacked plant tissue, and white or silvery patches and streaks on leaves, fruits and pods. Affected tissue will dry up when the damage is severe. 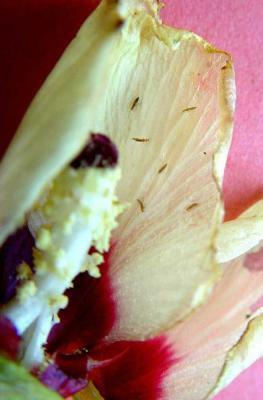 A further indicating of attack by thrips is small black spots of faecal material on the infested parts of the plant. 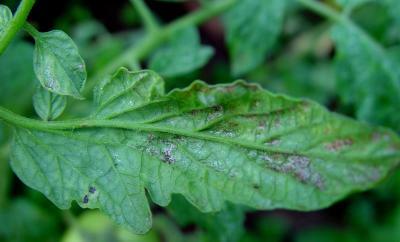 However, small dark spots can also be observed on plants attacked by other insects such as lace bugs. Damaged leaves may become papery and distorted. Infested terminals lose their colour, roll, and drop leaves prematurely. Feeding on fruits leaves a roughened silvery texture on the skin. Flowering stage, post-harvest, seedling stage and vegetative growing stage. Growing points, inflorescence and leaves. Inflorescence: lesions; abnormal colour; abnormal forms. Leaves: lesions; abnormal colours; abnormal forms. Thrips on onion. 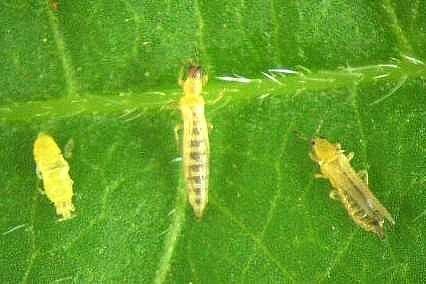 Thrips are 1-1.5 mm small. Eggs are very tiny. A single egg is 0.25 mm long and 0.1 mm wide. They are white when freshly laid and turn pale yellow toward maturation. Eggs are usually laid singly inside the plant tissue, and are therefore not visible. Some thrips (e.g. Haplothrips spp) lay eggs singly or in clusters attached to the plant surface. Larvae. The first and second instar larvae are very small (0.5 to 1.2 mm), elongated, slender, and vary in colour from pale-yellow, orange or red according to the species. They have piercing-sucking mouthparts. They resemble a miniature version of the adults but do not have wings. Pre pupa and pupae. These two or three instars are intermediate forms between the nymph and the adult. They have short wing buds but no functional wings. During these stages thrips are inactive and do not feed and therefore they do not do cause any damage to the plant. Pupation may occur on a plant or in the soil beneath, depending on species. Close-up of thrips (Megalurothrips sjostedti (black) andFrankliniella occidentalis (yellow). Real size 1 to 1.5 mm. The life cycle takes about two to three weeks under warm conditions, which gives them a enormous capacity for increase. 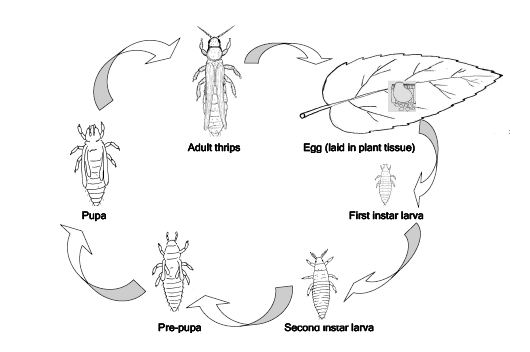 Thrips migrate actively between different hosts. This illustration shows the methods promoted on infonet-biovision. The methods shown at the top have a long-term effect, while methods shown at the bottom have a short-term effect. In organic farming systems, methods with a long-term effect are the basis of crop production and should be of with preference. On the other hand methods with a short-term effect should be used in emergencies only. On infonet we do not promote synthetic pesticides. Further below you find concrete preventive and curative methods against Thrips. Monitor the crop regularly. Early detection of thrips is important to determine an appropriate control strategy. In the case of onions, randomly sample plants and evaluate thrips numbers and damage under leaf folds. Sample at least 5 plants from 4 separate areas of the field. (For more information on monitoring and damage thresholds (click here to see datasheet on onions). In other crops pay particular attention to flower buds and flowers. Thrips can be easily detected by shaking leaves and flowers on a white piece of paper. Adult thrips can be monitored by mass trapping with coloured (blue, yellow or white) sticky traps or water traps in the nursery or field. The type of crop damage needs to be taken into consideration when deciding on the need for control measures and the appropriate strategy. This is particularly important in the case of thrips-transmitted virus diseases. The prevention of these diseases is difficult since relatively small numbers of vector thrips can result in high rates of pathogen spread. In general, transmission of the plant pathogen occurs so quickly that the thrips are not killed before they have transmitted the virus to the plants. In these cases, the best strategy is to keep the crop free of thrips at least during the most vulnerable period of the crop (i.e. young growth). Provide good growing conditions for the plants to ensure rapid growth. Environmental stress that weakens plants makes them more susceptible to thrips attack. In particular, plants under water stress are very susceptible to direct thrips damage. Adequate irrigation is a critical factor in minimising damage. Ploughing and harrowing, and solarisation can kill pupae in the soil from previously infested crops. Well-established crops can withstand attack better than newly planted, therefore early planting is desirable particularly in rain-fed crops. This is especially beneficial in light, dry soils, where it is common for plants to suffer from water shortage as the growing season progresses. In Egypt, intercropping onion and garlic with tomato reduced infestations of the onion thrips by almost 80%, but the yield of both crops declined. 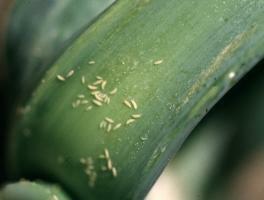 In England, infestation of the onion thrips (Thrips tabaci) on onions was halved when intercropped with carrots. The effect was greater with closely alternating single rows of each. Infestation of the onion thrips on cabbage was reduced tenfold by growing clovers (Trifolium repens or T. subterraneum)between rows (Parella and Lewis, 1997). Avoidance of successive planting of susceptible crops helps reduce the impact of thrips. Identification of the thrips involved is important to know the host range of crops adequate for crop rotation. Thus, in the case of onions, they should not be planted near grain fields. Natural enemies, in particular predators are often found feeding on thrips. They include predatory thrips, predatory mites (e.g. Amblyseius spp.) anthocorid bugs or minute pirate bugs (Orius spp. ), ground beetles, lacewings, hoverflies, and spiders. They are important in natural control of thrips. The parasitic wasp Ceranisus menes is an important natural enemy. The farmer can increase the number of these natural enemies by providing protective habitats for them. For more information on natural enemies click here. Pathogens such as the fungi Entomophthora, Verticillium lecanii, Beauveria bassiana and Metarhizium anisopliae are also important in natural control of thrips. Spray formulations of Beauveria bassiana are used for the control of thrips. Thismicroorganism is most effective when used early before large thrips populations have built up. Spinosad, a microbial insecticide, is very effective in controlling thrips. This biopesticide is derived from the fermentation of an Actinomyces bacterium, commonly found in the soil. In Kenya, this microbial pesticide is sold as Tracer 480 SC(r). Neem-based pesticides are reported to control young nymphs, inhibit growth and development of older nymphs, and reduce egg-laying by adult thrips. Adding 0.1 to 0.5% of soft soap enhances efficacy of neem-based pesticides. Other botanical pesticides that have been recommended for management of thrips include garlic, rotenone, ryania, pyrethrum and sabadilla. A homemade botanical spray of garlic and pepper has been recommended for organic growers in USA (ATTRA, 2004). The garlic/pepper mixture is made by liquifying two bulbs of garlic and two cayenne or habanero (hot) peppers in a blender 1/3 full of water. Solids are strained out, and enough water is added to make one gallon of the concentrate. The spray solution is prepared by mixing 1/4 cup of the concentrate with 2 tablespoons of vegetable oil and enough water to make 1 gallon (about 22 litles) (ATTRA, 2004). For more information on garlic recipe click here. For more information on pyrethrum recipe click here. Sulphur, insecticidal soaps and diatomaceous earth have demonstrated efficacy in suppressing thrips in several crops. Three applications of superfine sulphur at monthly intervals are recommended in fruit crops. Lime sulphur has also been recommended as an alternative. However, care should be taken when using sulphur as it has been reported to harm some predatory mites. Flour/starch preparations have been recommended for control of thrips. For more information on Flour preparation click here. Coloured sticky traps (blue, yellow or white) or water traps are useful for monitoring and in some cases reducing thrips by mass trapping them in the nursery or field. Research in California has shown that hot-pink sticky cards attract more thrips than blue-coloured traps. The colour spectrum of the boards is important for the efficacy of the sticky traps. Bright colours attract more thrips than darker ones. For more information on sticky traps click here. Overhead irrigation and rainfall reduce thrips numbers. Irrigation by flooding fields has been found to reduce thrips damage. It destroys a large proportion of pupae in the soil. Ultraviolet-absorbing plastics, used to build walk-in field tunnels have proved effective in protecting crops from western flower thrips. Reflective mulches deter thrips. Aluminium-surfaced mulch (e.g. coated plastic mulch) has considerably decreased thrips and virus infection in tomato, pepper and tobacco. The effectiveness of the mulch decreases with increased shading by lower leaves (Lewis, 1997). Lewis, T. (1997). Field and Laboratory Techniques. In Thrips as crop pests (1997). Edited by T. Lewis. CAB International. Institute of Arable Crops Research - Rothamsted, Harpenenden, Herts, UK. Pages 435-475. ISBN: 0-85199-178-5. Parella, M. P. and Lewis, T. (1997). IPM in Field Crops. 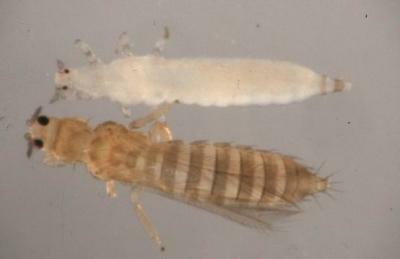 In Thrips as crop pests. (1997).. Edited by T. Lewis. CAB International. Institute of Arable Crops Research - Rothamsted, Harpenenden, Herts, UK. Pages 595-614. ISBN: 0-85199-178-5. 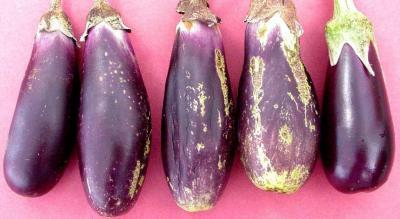 Beauveria bassiana (Bb plus (r)) is available at Juanco SPS Ltd. http://juancogroup.com/.